The Service Location Protocol (SLP) provides a scalable framework for the discovery and selection of network services. Using this protocol, computers using the Internet no longer need so much static configuration of network services for network-based applications. This is especially important as computers become more portable, and users less tolerant or able to fulfill the demands of network system administration. Traditionally, users find services by using the name of a network host (a human-readable-text string) which is an alias for a network address. The Service Location Protocol (SLP) eliminates the need for a user to know the name of a network host supporting a service. Rather, the user names the service and supplies a set of attributes which describe the service. The Service Location Protocol (SLP) allows the user to bind this description to the network address of the service. Service Location provides a dynamic configuration mechanism for applications in local area networks. It is not a global resolution system for the entire Internet; rather it is intended to serve enterprise networks with shared services. Applications are modeled as clients that need to find servers attached to the enterprise network at a possibly distant location. For cases where there are many different clients and/or services available, the protocol is adapted to make use of nearby Directory Agents that offer a centralized repository for advertised services. The basic operation in Service Location is that a client attempts to discover the location of a Service. In smaller installations, each service will be configured to respond individually to each client. In larger installations, services will register their services with one or more Directory Agents, and clients will contact the Directory Agent to fulfill requests for Service Location information. Clients may discover the whereabouts of a Directory Agent by pre-configuration, DHCP, or by issuing queries to the Directory Agent Discovery multicast address. The following describes the operations a User Agent would employ to find services on the site’s network. The User Agent needs no configuration to begin network interaction. The User Agent can acquire information to construct predicates which describe the services that match the user’s needs. The User Agent may build on the information received in earlier network requests to find the Service Agents advertising service information. A User Agent will operate two ways: If the User Agent has already obtained the location of a Directory Agent, the User Agent will unicast a request to it in order to resolve a particular request. The Directory Agent will unicast a reply to the User Agent. The User Agent will retry a request to a Directory Agent until it gets a reply, so if the Directory Agent cannot service the request (say it has no information) it must return a response with zero values, possibly with an error code set. If the User Agent does not have knowledge of a Directory Agent or if there are no Directory Agents available on the site network, a second mode of discovery may be used. The User Agent multicasts a request to the service-specific multicast address, to which the service it wishes to locate will respond. All the Service Agents which are listening to this multicast address will respond, provided they can satisfy the User Agent’s request. A similar mechanism is used for Directory Agent discovery; Service Agents which have no information for the User Agent MUST NOT respond. previous responders. Only those Service Agents which are not on the list respond. Once there are no new responses to the request the accumulation of responses is deemed complete. Depending on the length of the request, around 60 previous responders may be listed in a single datagram. If there are more responders than this, the scaling mechanisms should be used. While the multicast/convergence model may be important for discovering services (such as Directory Agents) it is the exception rather than the rule. Once a User Agent knows of the location of a Directory Agent, it will use a unicast request/response transaction. The Service Agent SHOULD listen for multicast requests on the service-specific multicast address and MUST register with an available Directory Agent. This Directory Agent will resolve requests from User Agents which are unicasted using TCP or UDP. This means that a Directory Agent must first be discovered, using DHCP, the DA Discovery Multicast address, the multicast mechanism described above, or manual configuration. 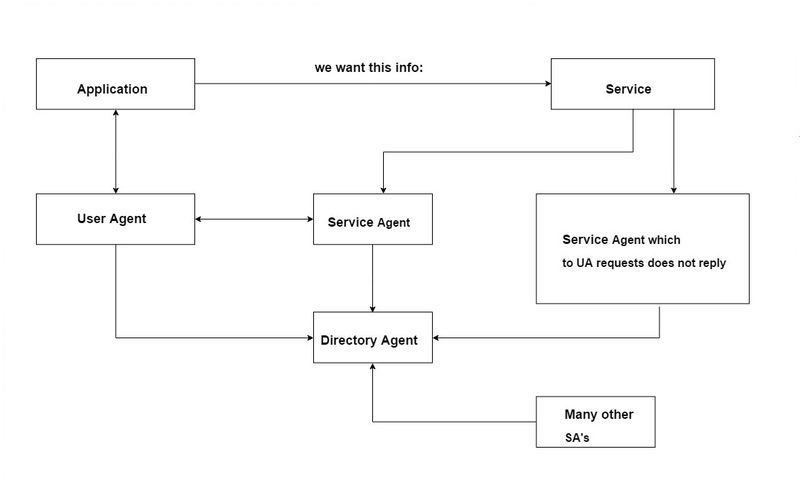 A Service Agent which does not respond to multicast requests will not be useful in the absence of Directory Agents. Some Service Agents may not include this functionality if an especially lightweight implementation is required. If the service is to become unavailable, it should be deregistered with the Directory Agent. The Directory Agent responds with an acknowledgment to either a registration or deregistration. Service Registrations include a lifetime, and will eventually expire. Service Registrations need to be refreshed by the Service Agent before their Lifetime runs out. If need be, Service Agents can advertise signed URLs to prove that they are authorized to provide the service. The following header is used in all of the message descriptions below and is abbreviated by using “Service Location header =” followed by the function being used. Length The number of bytes in the message, including the Service Location Header. O The ‘Overflow’ bit. See Section 18 for the use of this field. M The ‘Monolingual’ bit. Requests with this bit set indicate the User Agent will only accept responses in the language that is indicated by the Service or Attribute Request. U The ‘URL Authentication Present’ bit. A The ‘Attribute Authentication Present’ bit. F If the ‘F’ bit is set in a Service Acknowledgement, the directory agent has registered the service as a new entry, not as an updated entry. Dialect Dialect tags will be used by future versions of the Service Location Protocol (SLP) to indicate a variant of vocabulary used. This field is reserved and MUST be set to 0 for compatibility with future versions of the Service Location Protocol (SLP). Strings within the remainder of the message which follows are to be interpreted in the language encoded in this field. Note that, whenever there is an Attribute Authentication block, there will also be a URL Authentication block. Thus, it is an error to have the ‘A’ bit set without also having the ‘U’ bit set.